A new year. January 11 to be exact. Almost half a month gone and I'm not highly motivated to start the year. So I sit, surround by a pile of books to be read, I've cleaned lots of draws, and tossed out lots of stuff. By now I usually have a notebook full of ideas and plans made. As a matter of fact, I usually start planning right after Christmas is over. I have the notebook, it is right beside me, but not a note is in it yet. Oh, I have ideas running around in my head but so far, that is where they stay. I also have blog post that I want to get to, like maybe finishing up my Random House trip, or maybe posting from Christmas, but nothing. I sit, I knit and I think. So when this happens to me...I go to the ocean. It's where I find peace, quiet, inspiration and sort the cobwebs out of my head. That's exactly what I did, twice last week. Salem Massachusetts, for me, the gateway to the ocean. I know most of you know I was born and brought up here and so, when I need space or time to think, ponder and just be, I come to the Willows, Winter Island and the Collins Cove. The water connects, I do not have to move very far from one spot to the other. Salem is where I come to sort things out, take photo's and talk to the seagulls. Oh, they listen for sure. In the winter when things are quiet, they are much more eager to show you their survival skills. No one is around to feed them popcorn and ice cream so they have to rely on themselves. I'm like them right now. I'm relying on myself to find my way into this New Year. 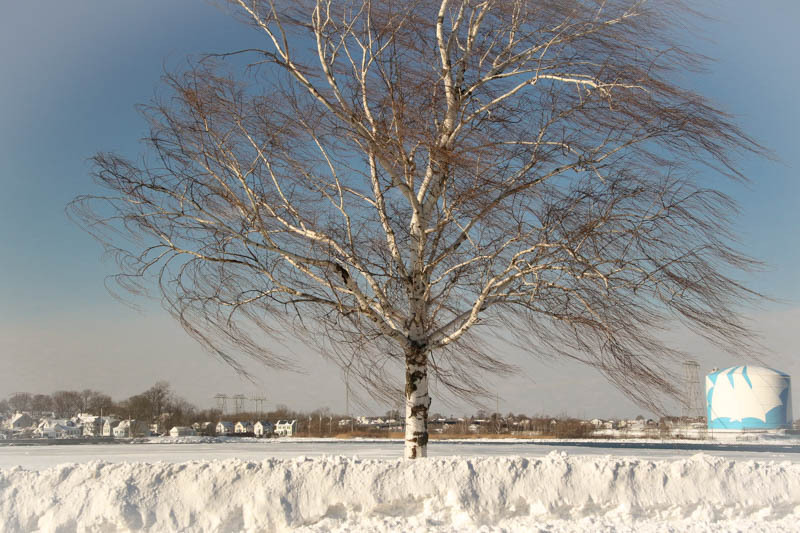 You may also know that here in New England we have had one of the coldest winters in many a year. We had snow on Christmas day for the first time in 11 years..Then we also got the blizzard. To say I had cabin fever would be putting it mildly. Also, the wind was crazy, as you can tell from the tree above and that water in the cove was frozen over close to the shore. I really think this put an edge on my mood. So one day, in that wind, I bundled up and took off for Salem...I knew it would be a challenge but I also knew it would be good for my soul. Honestly this photo was out in an open area and I almost got blown away. Hey, but the sun was shinning. My first stop is usually Winter Island. I love going down and watching the seagulls and listening to the buoys banging back and forth. The sound reminds me of the bells at my meditation practice so I find the buoys soothing. They have lots of benches here for sitting out but also lots of people just sit in their cars facing the ocean. The seagulls were very busy today fishing. Have you ever sat and watched them fish, especially in the winter. They walk along the sandbars and dig for clams...when they get a nice big one, they go way up into the sky and circle around to find a big boulder or the pavement. If it's empty, they dropped the clam. It shatters when it hits the ground and they fly down to feed. They do this time and time again. If you look closely above, you can see that the seagull has just let go of his clam. They are so graceful flying, like they are dancing..it is mesmerizing and calming and I could feel myself letting go of whatever I was holding onto. I stayed for awhile just sitting and every once in awhile getting out to snap a shot, always leaving the car door open for quick retreat. I left Winter Island for awhile and drove over to the other side of the Willows. It was quiet and the ocean was calmer further out. 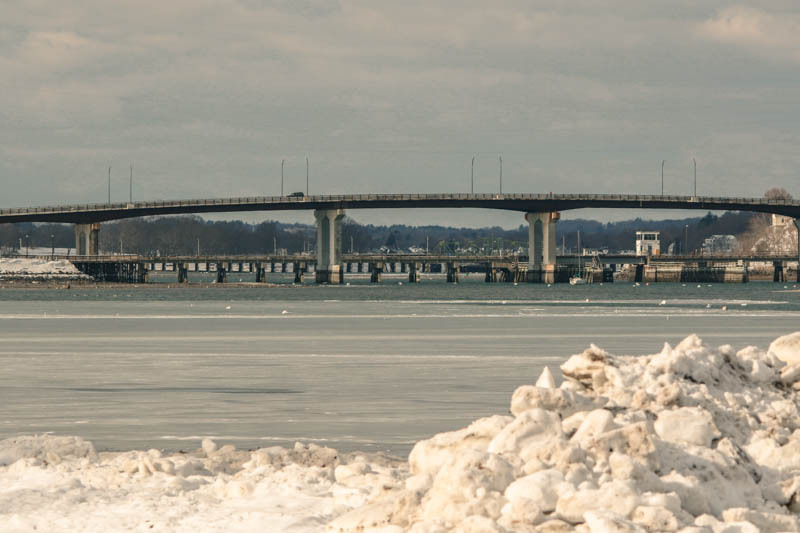 The bridge connecting Salem to Beverly was also slow. Not much traffic this day. People mostly inside. I do love this view in the summer when it is just jammed with boats of all sizes...but the winter, cold and with snow, brings it's own rewards. In the summer time this is one of my favorite spots to sit. Looking from Salem over to Beverly. I love the church steeples and the homes that line the shore. Both sides of the water lined with benches for resting and watching...thinking and sorting. Birds flying and and fish swimming. Today it was just me and my seagull friends. One walking the shore, one flying overhead. Hardly little creatures. Most people don't like seagulls but I do. They are fascinating and in some ways reflect back to me my love of the ocean. I would have loved being out there walking the shore like them. After nearly an hour here and snapping a few photo's of this place that I love...I started to think about what I might like to do this year. I was letting my mind take over. Do you know how amazing it is to be alone in nature. Nature is not always the woods or the mountains. The ocean is a huge part of nature and most don't get to live it. I am so grateful for my time spent at the shore. This is where I ended up at the end of my mini retreat of finding myself. The benches were naked of snow and people. The Willow tree was stretching it's limbs waiting for summer to return so it could do it's job of shading those who visited. I was far enough out on the point so that the ocean here was free flowing with just a few buoys and birds flying. My time here was well spent and I knew now that I could go home and maybe get started on this New Year. One thing though that is running through my head is maybe I'll take on a project this year. I'm thinking I would like to visit all the streets in my old neighborhood here in Salem and see what I find...oh I know I'll find the ocean but I'd like to find some old memories and perhaps even a few new ones...here's to 2018...May it be gentle as it flows forward.